Angler Guido Rahr, III potentially set the new men’s 10 kg (20 lb) tippet class world record for taimen (Hucho taimen) with this incredible 37.76-kilogram (83-pound, 4-ounce) fish that he caught and released on September 19, 2018 while fly fishing Russia’s Tugar River. If approved, the catch will be the heaviest taimen ever recorded by the IGFA on fly tackle and will replace the existing record of 32.26 kilograms (71 pounds, 2 ounces). 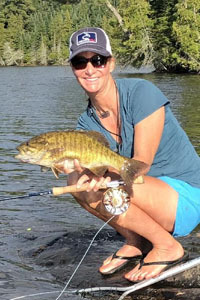 IGFA Representative Meredith J. McCord caught and released this 1.56-kilogram (3-pound, 6-ounce) smallmouth bass (Micropterus dolomieu) on July 3, 2018 while fly fishing Lake Ontario, Canada. McCord only needed a few minutes to land the bass after it hit the popper fly she was casting. If approved, the catch will become the new women's 3 kg (6 lb) tippet class world record, which currently stands at 1.39 kilograms (3 pounds, 1 ounce). 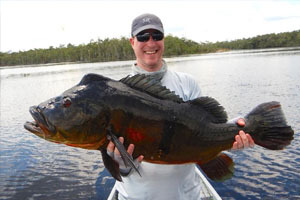 Arthur Weston caught and released this massive speckled peacock (Cichla temensis) on September 19, 2018 while fishing the Curicuriari River in northwest Brazil. Weston played the potential record peacock for approximately 10 minutes after it hit the topwater lure he was casting. Measuring out to 90 cm in length, Weston’s catch would tie the current All-Tackle Length world record if it is approved. Capt. 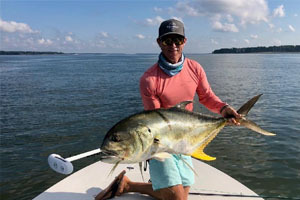 Brian Vaughn potentially set the new men's 4 kg (8 lb) tippet class world record for crevalle jack (Caranx hippos) with this impressive 15.87-kilogram (35-pound) fish that he caught on September 20, 2018 while fly fishing off Hilton Head Island, South Carolina. Vaughn skillfully played the fish for more than two hours after it crushed the fly he was casting. If approved, the catch will replace the existing record of 14.06 kilograms (31 pounds) that was caught back in 1983!